As early as 1928, the Japanese Army had been developing and testing amphibious tanks and created several experimental models such as the SR-II, the Type 1 Mi-Sha and the Type 92 A-I-Go which either never made it off the drawing board or were produced only as one-off prototypes for concept testing. In 1940, The Navy took over development of amphibious vehicles and two years later came up with the Type 2 Ka-Mi. 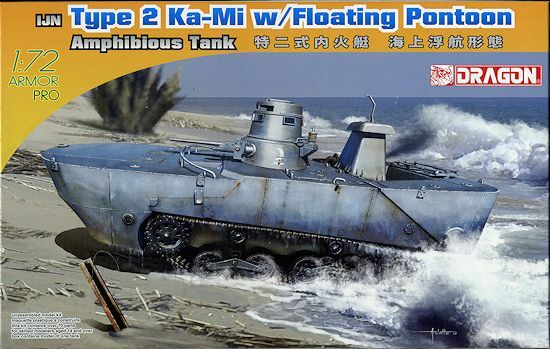 The Type 2 Ka-Mi was designed for the Navy's Special Naval Landing Forces for the amphibious invasion of Pacific Islands without adequate port facilities, and for various special operations missions. Only 184 units of the Type 2 Ka-Mi were built, beginning in 1942, due to the number of complex components and due to the fact that it had to be nearly completely hand-built. The Type 2 Ka-Mi was based on the Army's Type 95 Ha-Go light tank, but with an all-welded hull with rubber seals in place of the riveted armor. It was intended to be water-tight. Large, hollow pontoons made from steel plates were attached to the front glacis plate and rear decking to give the necessary buoyancy. The front pontoon was internally divided into eight separate compartments to minimize the effects of damage from flooding and shellfire. These flotation devices could be jettisoned from inside the tank once the tank landed and commenced ground combat operations. The Type 2 Ka-Mi's gun turret with a high-velocity Type 1 37 mm gun and a coaxial Type 97 light machine gun was able to rotate 360°. A second Type 97 light machine gun was located in the tank's bow. Occasionally Type 2 Ka-Mi's were armed with a pair of naval torpedoes; one on either side of the hull. The Type 2 Ka-Mi could also be launched from the deck of a submarine. The Type 2 Ka-Mi was capable of attaining speeds of 10 km/h in the water with a range of 150 km through two propellers situated at the rear of the hull, powered by the tank's engine. Steering was in the control of the tank commander, who operated a pair of rudders from the turret through cables. That the crew included an onboard mechanic is an indication of the complexity of the design. The Type 2 Ka-Mi came into active service after the initial successful campaigns of World War II, and was thus too late to be used in its original design mission of amphibious landings. Many units were assigned to naval garrison detachments in the South Pacific Mandate and in the Netherlands East Indies. The Type 2 Ka-Mi was encountered by the United States Marine Corps in the Marshall Islands and Mariana Islands, particularly on Guam, where it was dug into the ground and misused in static defense positions. It was also encountered in combat by U.S. Army forces at Aitape and Biak during the New Guinea campaign and during the fighting on the Philippine island of Leyte in late 1944.According to Ralph Zumbro in his book 'Tank Aces', several Ka-Mi were destroyed by Army LVT-1's off the coast of Leyte during history's only Amtank vs. Amtank action. A handful more were captured by Army troops on Luzon in 1945,but had not entered combat. A number of photos exist of these vehicles, as well as several others captured by Australian and Commonwealth troops. In common with most Japanese Armor, it was no match for Allied tanks or anti-armor weapons. This kit is pretty much the same as the earlier boxing without the pontoons. To accommodate what is a considerable increase in the stuff that is attached to the tank, a rather large sprue is included which has the forward and aft pontoons along with the attaching bits. These bits include an extension to the turret to keep out water and a tall intake housing to keep from flooding the engine while in the water. Like the earlier boxing, the detailing is superb for such a small scale tank. The same nice DS tracks are used as well. Bogies are molded in sets with the fore and aft road wheels molded along with the frames. In fact, one basically builds up the standard Type 2 and then attaches all the rest of the stuff in the last construction step. Like the earlier boxing, a lone piece of photo etch is provided for the muffler screen. Instructions are well drawn with the usual Gunze and Model Master color references. The decal sheet on this one seems to be the same as for the earlier kit, just with a few different markings used. The options are all in light grey with only numbers or symbols to differentiate between them. One is based at Kwajalein and several others based in Papua, New Guinea. 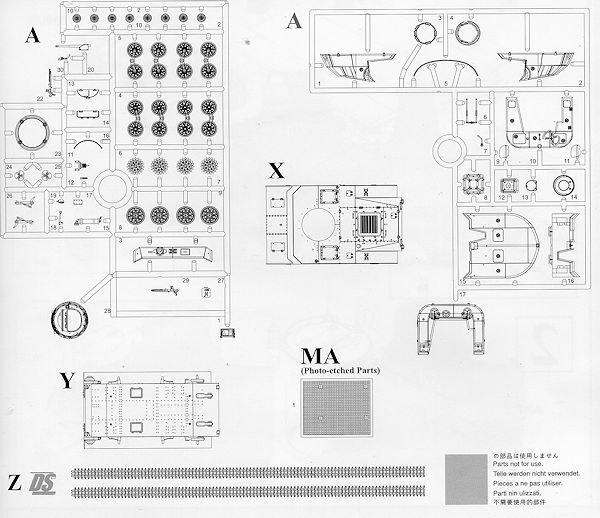 This is not a very complex kit and one that most modelers should be able to complete in a relatively short period of time. The addition of the pontoons is a real plus and is sure to add an interesting and unusual tank to your collection.